This is definitely one of the harder-to-find books. They made 500 of them but they don’t really look that special so I would imagine that many of these are languishing in comic shop budget bins or stuck in closets. You see one on eBay once in a great while. I got mine, like so many other Ultraverse books, on accident. I bought a silver Mantra hologram cover and this book was thrown in as a freebie. Nice! Its value is hard to define. I would pay $5 if I saw one at a convention or comic shop, maybe $10 depending on how my day was going. And for me that is a lot. 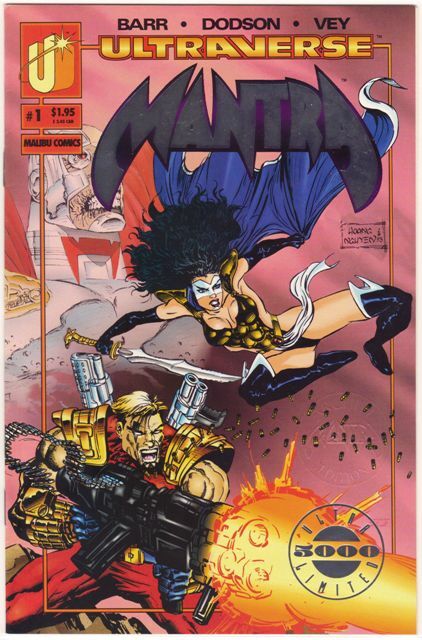 There are very few Ultraverse books for which I would pay more than a buck or two. Not that I don’t want them, but I will probably see them somewhere else for a very low price. If you’re patient, all this stuff is cheep. Er, cheap. The thing to distinguish this book as an “archive edition” is a unique stamp that you can barely see on the right side of the cover (it says “Mantra Archive Edition“). And if there were 5,000 of each Ultra 5,000 print run, well, here is what happened to 500 of them. The certificate is signed by Mike Barr and Chris Ulm. The cert says the book came in a ProGard but mine is just in a regular bag and board. 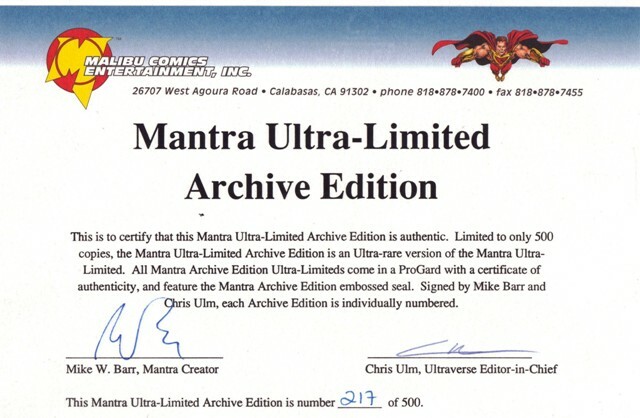 This entry was posted on Friday, April 29th, 2011 at 4:10 pm	and tagged with Chris Ulm, Mantra, Mike Barr, Ultraverse and posted in COAs, Premium books. You can follow any responses to this entry through the RSS 2.0 feed.